Attorney General William Barr has decided that he wants to be the latest stooge to violate the law in the name of protecting Donald Trump. It’s not clear why Barr thinks he’s going to be able to pull it off without facing consequences, but Barr is abusing his power and breaking the law right now on a level perhaps never seen in American politics. Speaker of the House Nancy Pelosi is having none of it. William Barr testified before Congress yesterday and again today, and he’s said a number of stunning things. First, he’s refusing to meet the House’s demand to turn over the full Mueller report, subpoena threat be damned. Second, Barr is accusing the FBI of “spying” on the Trump 2016 campaign, despite admitting in the next breath that he has no evidence to support his own claim. Barr also appears to be involved in Treasury Secretary Steve Mnuchin’s criminal plot to block House Democrats from their legal right to see Trump’s tax returns. 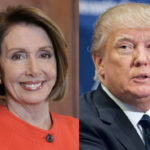 Considering how outraged Nancy Pelosi is, and how deep into criminal territory Trump, Barr, and Mnuchin are right now, we wouldn’t be surprised if Pelosi and the House Democrats take swift and drastic action. They’re already within their legal rights to arrest Mnuchin and hold him in contempt of Congress for illegally blocking the release of Trump’s tax returns. Something has to give – immediately – and if you’ve followed Pelosi’s career, she’s not to be messed with.